Michaela Tomlinson and I set off at three o'clock on Tuesday, 15th August, with Doonaveeragh Emma, Kvint, Michaela's two mares Birmena and Cabela and Twiglet. We didn't have the most relaxing of journeys as the lorry didn't seem on her best form, being a little bit reluctant to start every time we stopped. Not the greatest feeling with a ferry ride and six hours driving in France to be completed. The horses all travelled well and we arrived at Auvers at about 4.00, so the horses were quickly settled in and we were able to give them a quick graze before setting off for our B&B, which wasn't quite as short a walk from the showground as I remembered! However, it was well worth the walk, and I can thoroughly recommend Madame Christine Connan's lovely self contained flat in Auvers, if you are ever going that way. 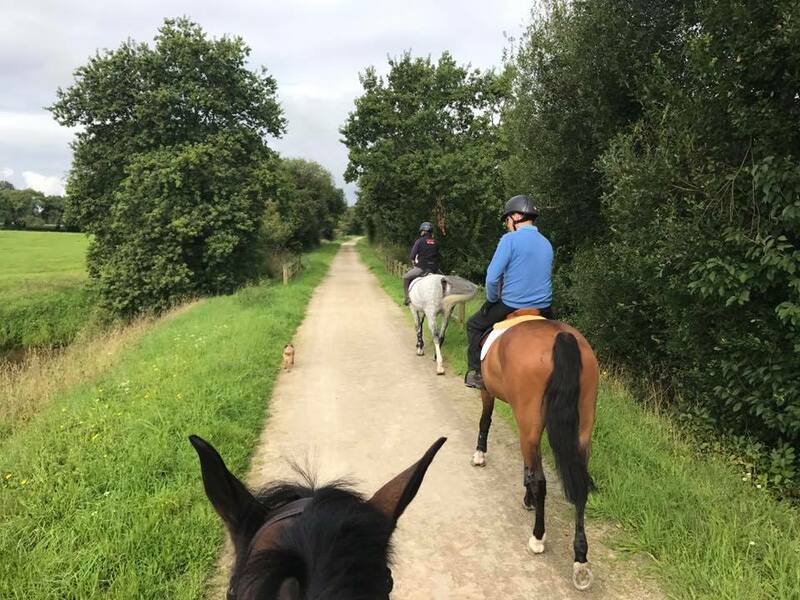 On Wednesday morning we hacked the horses along the disused railway line behind the showground and they all trotted up fine. As a fellow ex-event rider, Michaela was a little bit astounded at how casual the trot-up was. The horses only trotted away and some of them were definitely not as sound as you would like. After two lovely sunny days Thursday morning dawned very rainy. I could hardly see Emma's ears it was pouring so hard, and she actually battled bravely round just having one fence down when she wanted an extra stride. However, I had definitely underestimated how rusty she would feel after nine weeks without jumping and Thursday rather set the scene for the week where she was a little bit worried on both Friday and Saturday. Michaela's horses jumped well every day, getting several placings and ended with both being placed in the 1.25 final the first week. Kvint also tried his heart out. He was a little bit unsettled for the first two days, and very green, especially when he spotted the photographer just before the first fence the first day. He managed two placings in the first week and got more confident every day. It was also great to see Bumble Thomas jump so well to finish 5th in the enormous 2* Grand Prix. Kvint - 1.25 first week. Mark came out for all the jumping for the first week which was especially nice when I wasn't having the greatest week. We visited Polly's lovely new home, in the very rural area near St Pierre sur Dives, and it was so nice to see so much of her while we were in France. We all had a great hack along the railway line on the Sunday between the shows, Mark rode Kvint and Twiglet came too. Before Mark went home, and with some help from Alain Hinard who owns Auvers, and the most amazing mechanic from Corentan, we managed to get both batteries on the lorry replaced. What a relief, and also fantastically good value. Not such great news when Mark called me from the ferry to say he had still got my credit card with him. However, we were rescued by Michaela's lovely friend Stephanie who managed to collect the card from the Purser's office on the boat on her way out! Thank you to Brittany Ferries for being so kind and helpful! 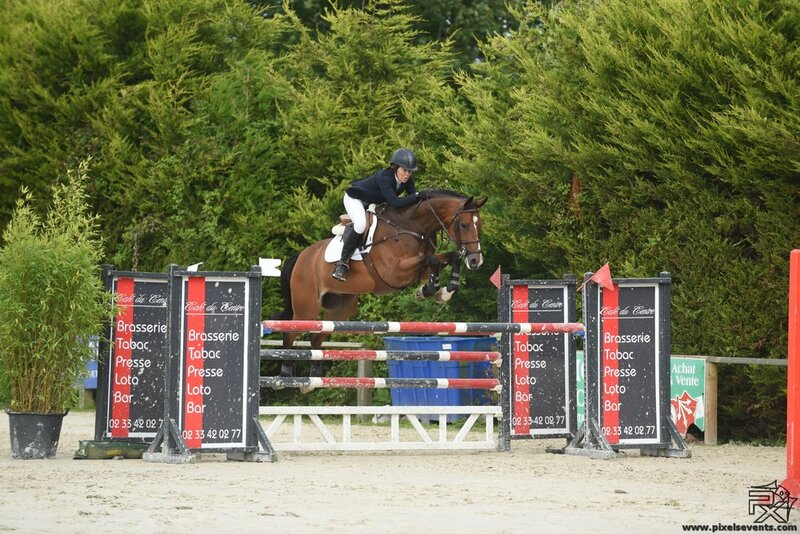 Emma started the second week well with a clear round in the 1.30 to finish just out of the money. Kvint was a little bit above himself and onward bound for the first two days, but definitely redeemed himself with 9th in the 1.25 final. He was absolutely charming all show, and tried his heart out, in spite of the fact that he was so tired by the last day. Emma jumped well on day two for one down in the jump-off and actually jumped well in the Grand Prix until we had a slight miscommunication near the end. I think Michaela's mares were both placed every day except for one miscommunication, and finished up looking really confident. It was lovely to catch up with Louise Alston and her husband Michael who we met three years ago in Auvers and who have now moved to France. Louise has based herself with Jemma Kirk, who is always very successful at the French shows. We had decided not to head for home until Friday morning, as it's a six hour drive, and after riding all day in the intense heat and with the risks associated with going through Calais in the dark it seemed the easier option. We had a relaxing end to the afternoon, getting packed up extremely efficiently, paying our bills and getting a reasonably early night. The lorry started like a bird on Friday morning and we had a really smooth journey home. Emma - Grand Prix Week 2. In spite of the endless summer road works and people merrily bumping into one another we got home in good time for Michaela to set straight off for home, and my horses had a lovely couple of hours in the field. This was my fourth trip to Auvers, and although I certainly didn't get very rich on prize money, I think it is one of the friendliest shows. The courses are good and M. Hinard even took me into the vets in Carentan to get Twiglet's wormer and passport signed for the journey home. All importantly the lunch is delicious and I'm very glad to have discovered Madame Connan. We also discovered a good restaurant in St Marie du Mont by Utah Beach - Carentan isn't the greatest place for food or restaurant service. I hope I will be back next year. We have had the most lovely and relaxing bank holiday weekend at home, with Anna and Tom, and Sophie staying. Lots of barbecueing and lying in the sun, storing up some energy for the All England Jumping Championships at Hickstead later in the week, which are to be preceded with a lesson with Shane tomorrow to try and get Emma and I back on track. The All England Jumping Championships is, for me, the grand finale of the summer jumping, so to find myself flat on the floor by 8.45 on the first day after a failure to communicate properly with Benny was not the ideal start to a few very busy days. Feeling a little bit fragile, I climbed aboard lovely Culana Z who jumped a brilliant double clear in the Newcomers. I then jumped Benny hors concours in the Newcomers to make sure he hadn't lost any confidence before walking the 1.40 in the main ring for Emma. I knew the course would be strong, and it certainly didn't disappoint. After a shaky start when Emma ran me to the first fence, and then stopped when she saw how big it was, she actually jumped very well round the biggest course we have tackled to date. I finished the day jumping Catokyo in the five year old qualifier where she just hit the first fence before settling and jumping a good round. Day two started with Benny jumping a great clear in the 1.20 in ring three, before Emma jumped in the main ring again, this time in the 1.40 speed class. Shane very kindly helped me work in away from the other horses and she jumped another lovely round with just a couple of mistakes early on. However, with over 100 starters in each class, the courses were strong and there were very few clear rounds, and I was thrilled with her. She was much more confident on the second day, and I certainly felt much more settled and competent that I did last year. We were lucky to jump before the rain started as Catokyo and Culana had to jump their Newcomers in quite heavy rain and slippery conditions. 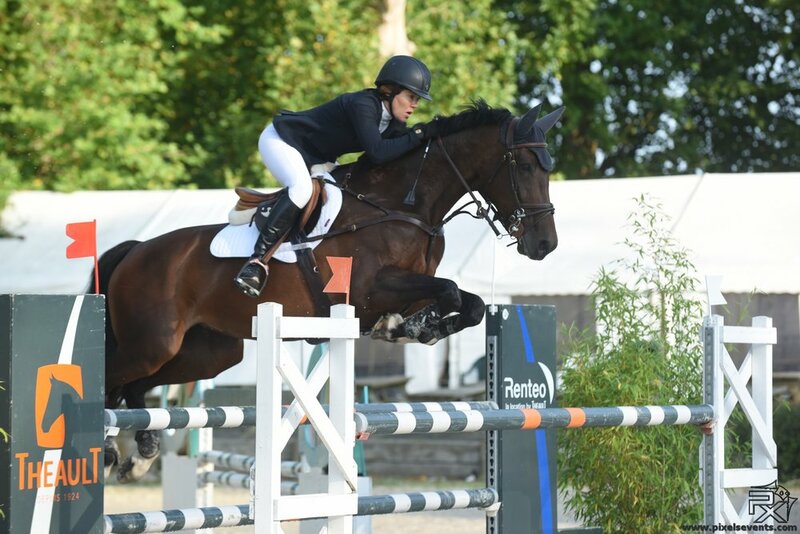 Saturday was another early morning, Catokyo and Culana both jumped very well in the Newcomers in ring 2 and Benny jumped a lovely round in the 1.20 on the all-weather. I had decided that Emma had jumped enough and that the Grand Prix on Sunday was going to be too much to ask, especially with rain forecast for Saturday night. Having completely failed to qualify for any finals all the horses had a lovely day off on Sunday while Mark and I went back to Hickstead to watch the Grand Prix which was won by Phillip Miller on Caritiar Z with Lucy Townley (Bunn) second on Billy Fanta. We had a lovely week at Hickstead, it was lovely to see Macolm, Judy and Nikki Pyrah with all their horses jumping clear every day, and we had a very competitive sports quiz evening with Clark Glasgow and his family. Our team was second which was actually my best result of the week. As always very many thanks to Steff Gibbs for all her hard work, and three very early mornings, and to Mark who came to watch Emma in the main ring every day, and supplied us with coffee and cakes when the energy levels were very low on Saturday. The horses are having a quieter time for a few weeks now. Emma is just in the field every day, while the others are hacking out to keep them ticking over, and we are all enjoying the wonderful Indian Summer.